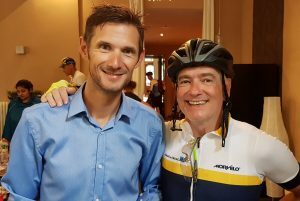 The 2017 Tour de France route saw a German Grand Depart and a very ‘European’ tour, with riders gathering in Dusseldorf to cycle on through Belgium, Luxembourg and finally into France. After the gruelling first half of the tour in 2016, we were grateful for kinder stages as we dealt with plenty of damp and chilly days in the more Northern stages. In spite of this, morale was buoyant and excitement built up to the first big climb up the infamous Planche des Belles Filles. “After a few days on Tour, at about the point where you are now, you start feeling worse and worse until it can’t get worse anymore because you are totally *****d”. … Sage nods/nervous laughter all round! On we went to the Jura for 3 epic (route and weather) stages taking us up to the first rest day. One of the big features of the tour this year was that it passed through all 5 French mountain regions (Vosges, Jura, Alps, Pyrenees, Massif Central) with the Jura being just as tough and fantastic as the Alps. None of the cyclists who were there will forget the Grand Colombier or the Mont du Chat for a while! Our first rest day was dominated by a 6 hour coach transfer from the Northern Alps across to the North Dordogne – not ideal, but what the pros do, we do! As ever, riders showed great ingenuity in finding ways to sleep on a coach. But the journey also marked a change in the weather – not that it was forever dry, but the temperatures rose and with the fast, flat transition stages to the Pyrenees lined by fields of sunflowers and we really knew we were riding the Tour de France! Up into the majestic Pyrenees for some chunky stages and late-night finishes for many. These are character-building mountains and we learned what it means to suffer … and to be triumphant in the face of adversity. Down once more onto the windy Southern section before heading back up into the Alps for more huge stages that included iconic climbs up Telegraph, Galibier and Izoard – ticks in boxes for our col collectors. And finally, a spin down to Marseille and a time trial for the penultimate stage of the tour, followed by a TGV transfer to the outskirts of Paris for the final glory ride into the city and the Champs Elysees (one lap is enough for anyone on those cobbles with that traffic). A job well done. We pride ourselves on our reputation for incredible camaraderie between riders. Every year is a good year and yet still some years stand out. 2017 was one of those years, with friendships forged for life. Of course the tour is challenging, but there was a lot of fun and laughter out there on the road too, with riders working hard to support each other with generosity, humour and humility. 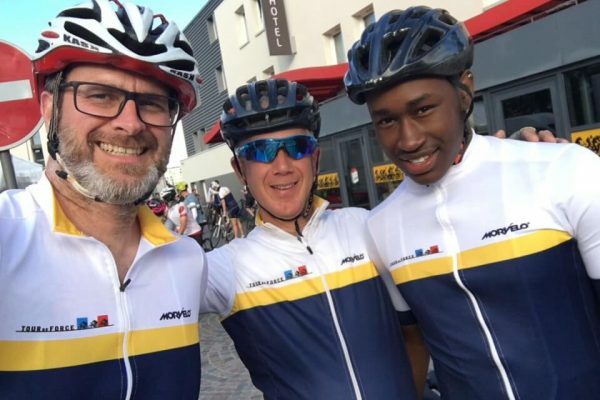 We were joined on tour this year by 3 charity visitors: Dequane and Martyn from Westminster House Youth Club rode a stage with us and Dequane did himself proud by cycling further than any charity youth visitor on tour with us to date. Our new French charity, Sport Dans La Ville, came and helped our support crew for a stage, buttering baguettes and cheering on our riders. And finally, Josh and Julian from Chaos Theory joined us in the Pyrenees for a calf-popping ride into the mountains. The feedback from all 3 charities has been fantastic and we’re excited to be able to continue bringing charity visitors to the tour with us, thanks to the on-going generous support of one of our Alumni riders who covers all the costs of this project. This has been an impressive year for fundraising, with the average amount raised punching well above the minimum required to participate as well as a few really impressive fundraisers helping to boost the total figure up to over £385,000. A huge achievement that enables the Trust to continue to go from strength to strength, supporting brilliant charities with larger grants to really make an impact on young lives. As ever, we couldn’t be more proud of all our fundraisers and grateful for their massive commitment to all aspects of taking part in Tour de Force. 2017 was our last year riding under the banner of Tour de Force. While the riders celebrated their achievement in Paris, our website flipped over to become Le Loop in readiness for sales for 2018 opening just 3 days later. As we finalise the paperwork with ASO, we are excited to have their approval and support as we continue to provide our winning formula of following the Tour de France route, one week ahead of the pros, while raising funds for the William Wates Memorial Trust. Only the name has changed – we will continue to run the event in exactly the same way, with the same staff and trustees at the helm. With sales off to a cracking start for 2018, the future’s bright! This entry was posted in Dates for your Diary, Le Blog, Previous Tours. Bookmark the permalink. ← TDF 2017 ON SALE!